“According to Toyota, the “i-ROAD takes the company closer to its goal of creating the ultimate range of eco cars.” As you’re surely aware, that range of eco cars includes the enormously successful Prius family, but this new machine is nothing like the hybrid hatchback. 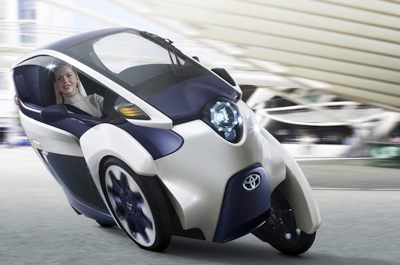 And it’s not even a car – Toyota calls the i-ROAD a Personal Mobility Vehicle. Toyota’s i-ROAD Concept, which debuts at this week’s Geneva Motor Show, is adorned with just three wheels, meaning it’s just as much a motorcycle as it is a car, and the driver and passenger sit in tandem style instead of side-by-side. This arrangement allows for a very thin 850mm width, which is about the same as a large motorcycle. Because the cockpit is enclosed, the occupants don’t need helmets, nor are they open to the elements outside. Also like a traditional two-wheeler, the i-ROAD tilts through the turns and when driving on uneven surfaces. Toyota says its computer-controlled Active Lean technology automatically balances the vehicle with no input from the driver. This is of course cool technology, and we have been awaiting skinny cars for a long time (even before GM’s Lean Machine). Even without automation, this could add significant capacity and safety to road networks, as well as providing space conservation and energy reduction. Some videos follow. When will Toyota (or anyone) mass produce this so the costs are below those of passenger cars.